Thanks to attendees, donors and sponsors of the 2018 Empty Bowls fundraiser, $8,000 was raised in support of area food pantries. The event, which was held on November 28, 2018 at the Holiday Inn, united community members, area businesses and students in support of a great cause. 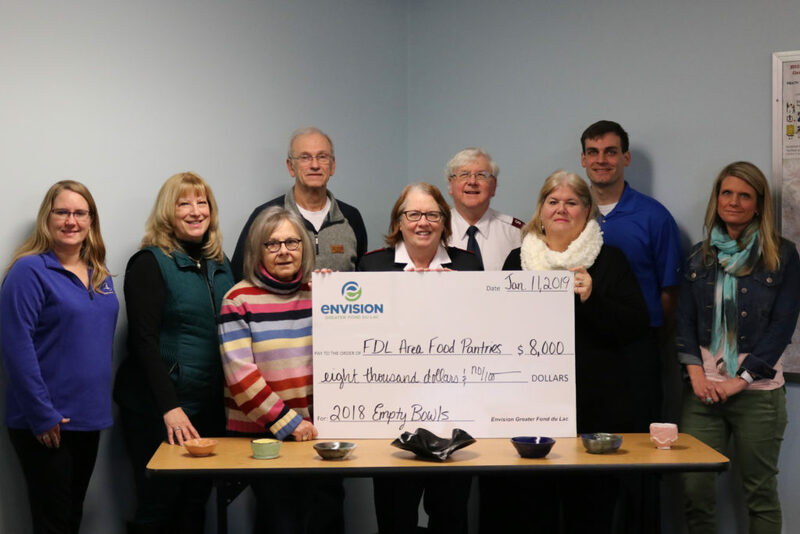 Pictured from left: Stephanie Albers, Horicon Bank – Chair, Empty Bowls Steering Committee; Marcia Snyder, Hometown Bank – Empty Bowls Steering Committee Member; Judy Cusick, Fondy Food Pantry – Board Member; Mike Breszee, St. Vincent de Paul Pantry; Majors Kim and Jon Welch, The Salvation Army of Fond du Lac; Lindee Kimball, Loaves and Fishes – Board President; Brian Mand, Aramark – Empty Bowls Steering Committee Member; and Melissa Worthington, Envision Greater Fond du Lac. Not pictured: Broken Bread Food Pantry. Organized by the Leadership Fond du Lac Alumni Group and sponsored by Agnesian HealthCare – a member of SSM Health, Associated Bank, Fond du Lac Morning Rotary Club, Fond du Lac Noon Rotary Club, Holiday Inn Fond du Lac, Society Insurance, and Spectrum, this event brought awareness to hunger in our community and it provided an opportunity for the community to come together to raise money for local food pantries and shelters. This year, five area food pantries benefited from the proceeds of the Empty Bowls fundraiser, with each receiving a check for $1,600. The following food pantries were assisted: Broken Bread, Fondy Food Pantry, Loaves & Fishes, Salvation Army and St. Vincent DePaul. The success of this event could not have been possible without the help of area businesses, donors, student artists and Leadership Fond du Lac Alumni – all coming together to give of their time, talents and resources. Delicious soups were donated by The Backyard Grill & Bar, Boda’s Restaurant, Salty’s Seafood & Spirits, Holiday Inn Fond du Lac, Sunset on the Water Grill & Bar, and Ziggy’s Pub. With each restaurant donating 20 gallons of soup, event attendees were able to sample various soups, as well as milk, breads and desserts provided by: Annie’s Fountain City Café, Aramark, Baker’s Pride Bakery, Crossroads Care Center, Festival Foods, Fishy’s Bakery, Fond du Lac High School, Horace Mann High School, Lake Breeze Dairy Group, Moraine Park Technical College, and Schreiner’s Restaurant. A cornerstone of this event is the concept and reality of an empty bowl, which serves as a reminder for those who go hungry every day. To bring awareness to this important social need, area art students and organizations crafted bowls, which allowed every event attendee to take a bowl, signifying the true purpose of the event. Participating schools and organizations included: Boys and Girls Club of Fond du Lac, Campbellsport Middle and High School, Fond du Lac High School, Horace Mann High School, Marian University, North Fond du Lac Alternative Learning Center, Oakfield Middle and High School, St. Mary’s Springs Academy, Theisen Middle School, UW – Fond du Lac Art Students League, and Winnebago Lutheran Academy. The Leadership Fond du Lac Alumni Group is comprised of graduates of the Leadership Fond du Lac Program, a program of Envision Greater Fond du Lac. For more information, contact Envision Greater Fond du Lac at (920) 921-9500 or visit www.envisiongreaterfdl.com. Leadership Fond du Lac is a program of Envision Greater Fond du Lac that provides information and experience to individuals who are willing to commit to serving their community. Accepted applicants learn about local institutions and issues and put their skills and knowledge to use through the required small group Community Project. Through the program, individuals develop leadership, interpersonal and communications skills, and develop a strong network throughout the community. For more information, contact Envision Greater Fond du Lac at (920) 921-9500 or visit www.envisiongreaterfdl.com.